Photo by Peter Belanger Photography. Though they’re still waiting for their liquor license to come through, husband-and-wife team Joel Bleskacek (Campton Place, Oliveto, 42 Degrees) and Maxine Siu (Oliveto, 42 Degrees) have opened their new Potrero Hill daytime restaurant. To recap from previous tablehopper coverage, ~PLOW~ is serving a classic American menu (such as French toast with caramelized bananas and crème fraîche, ricotta pancakes, a fried egg sandwich, and muffins and buttermilk biscuits), and it seems people are loving their plow potatoes (which are deep fried to order—don’t ask, just order them). Oh yeah, and let’s not overlook the biscuits and gravy made with their housemade sausage. And then there’s this little number, the Chinese breakfast with two fried eggs over steamed rice and Chinese sausage. Yum. Prices are nice (almost everything is under $10), and there are even breakfast options for little ones. As for lunch, there are a few salads, including a chicken salad, and sandwiches like a roast pork one, or grilled vegetables on ciabatta. There are also a couple hot dishes: semolina gnocchi ($9) in tomato sauce, and short ribs ($13) with polenta and gremolata. Expect all-day breakfast everyday, with lunch beginning at 11:30am, brunch on weekends, and lots of natural light with your meal. 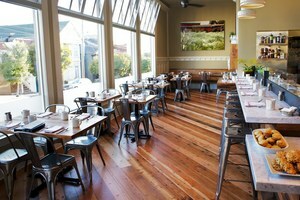 Hours are Tue-Fri 7am-2pm, and Sat-Sun 8am-2pm, and they will host the occasional winemaker dinner with Ruby Wine too. One more thing to note: people in SF talk about their business featuring all-local ingredients, but Plow’s owners took it one step further, since everyone they used to design the place (including their contractor) hails from their 94107 ZIP code. After a bit of a waiting game, chef Ian Marks, previously of Hog Island Oyster Company, will be opening his restaurant, ~BEAST AND THE HARE~ in the former La Provence space on Guerrero Street. His business partner is Dylan Denicke (another Hog Islander), who will manage the front of house. They have the keys and are currently cleaning and painting the 48-seater, pushing for an early November opening. The menu will be very “San Francisco farm-to-table,” along with oysters (natch), and since Marks spent some time at Fatted Calf, he’ll be doing his own charcuterie. (He also mentioned possibly doing his own cheese down the road as well.) The menu will feature about seven small plates, and two larger entrées, with nothing over $18. The look will be rustic and “old tavern-y,” with exposed wood, including a cypress communal table and bar top. Hours will be 5pm-10pm, and they’re also going to try out late hours Thu-Sat from 10pm-1am for industry folks, and weekend brunch. I heard word that executive chef Michelle Mah is no longer at downtown’s ~MIDI~. Unfortunately, I wasn’t able to track her down before my deadline to find out details about her next move. As for Midi, they are currently reviewing plans for the restaurant, so stand by for more details and an update soon. 185 Sutter St. at Kearny, 415-835-6400. 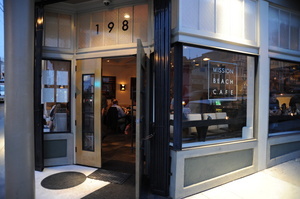 Thank heavens, something tasty is moving into the Ebb & Flow/Craig’s Place corner spot at 18th and Guerrero: a second location of Bill Clarke and Alan Carter’s ~MISSION BEACH CAFE~. The concept will be similar to the original location, but the menus will focus more on vegetables and seafood. Leading the kitchen is Trevor Ogden, the new executive chef of both locations, and MBC alum Ron Silverberg will return as chef de cuisine. Lunch and dinner will be served during the week, and brunch and dinner on the weekends. Michael Brennan will be handling the remodel and design. Exact plans, restaurant name (the latest liquor license calls it “Repast”), and opening date are TBD, stand by. 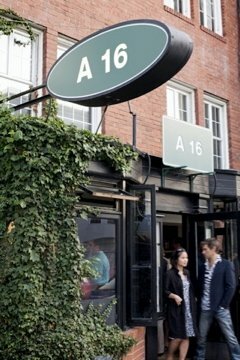 After a brief renovation period, ~A16~ reopens tonight, September 28th. And there will be a special guest this evening in honor of Puglia Wine Week: Francesco Domani, friend and general manager of Tormaresca winery, will be at A16 to share his stories of operating the Tormaresca winery in Puglia, which is owned by the Antinori family. There will be Tormaresca wines available by the glass, carafe, and bottle, and chef Liza Shaw will be offering some special dishes to pair with them, like a bruschetta of roasted sunchokes, preserved Meyer lemon, and sea urchin to pair with the chardonnay; pizza with ricotta, roasted anchocress, and bottarga; quattro formaggi ravioli with a black olive, tomato, and eggplant sauce; and roasted duck polpettine with braised treviso and mosto. 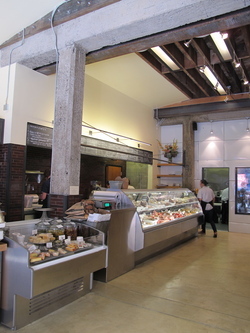 On Sunday afternoon, I walked into my kind of meat heaven: Taylor Boetticher’s new ~FATTED CALF~ storefront location in Hayes Valley. It’s all there, starting with a fantastic selection of local and heritage meats, plus salumi (finocchiona, mortadella, soppressata, pancetta, and more), hunger-inducing pâtés and terrines and rillettes and ciccioli, duck confit, sausages, and you can even purchase beautiful duck fat. There are also supplies from a variety of purveyors, like Andante cheeses, Della Fattoria bread, Rancho Gordo beans, St. Benoit yogurt, along with housemade pickles and sauerkraut. There are also prepared foods, like a meatloaf sandwich, a bollito misto (call first—it’s not there every day), a couple hot dog options, and a farro salad. The former knitting shop has been transformed into an airy-feeling location, with a gleaming Berkel slicer, Heath tiles, lots of wood, and quite the aging room, with salumi and sides of beef and pig hanging in the window. The space was designed by Wylie Price, and is really striking and a bit industrial. 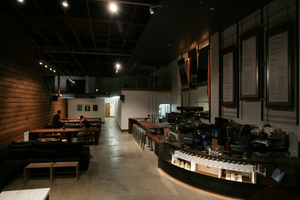 The shop is just down the street from Blue Bottle Coffee’s kiosk on Linden, which makes for a wonderful one-two punch. Open daily 10am-8pm. No fear, the Fatted Calf stand will remain at the Saturday Ferry Plaza Farmers Market and at Napa’s Oxbow Market. 320 Fell St. at Gough, 415-400-5614. Photo © 2010 Frankeny Images. The next time your sweet tooth strikes, you better hope it’s on a weekday from 5pm-7pm, because that’s when you can head on over to ~MIETTE~ in Hayes Valley for $1 macarons! 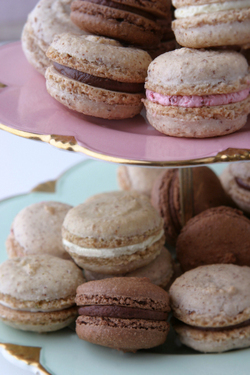 Yup, it’s a macaron happy hour. 449 Octavia St. at Linden, 415-626-6221. Now open in the Ferry Building is ~SIDEKICK~, the latest venture from Sue Conley and Peggy Smith of Cowgirl Creamery—they moved into the former (and adjacent) LuLu Petite space in the Ferry Building Marketplace. It’s basically a cheese and dairy bar, offering everything from a variety of mozzarellas to milks. The mornings begin with challah rolls with sweet and savory fillings, gougères (uh huh), cottage cheese with fresh fruit, and sweet and savory yogurt bowls. At 11am, the afternoon kitchen opens with a fresh mozzarella bar (with choices from burrata to fior di latte that come with mache, and either heirloom tomatoes or prosciutto), green salads, a daily artisan cheese plate, cheese soup (a Grana Padano panade with green beans, toast, and little Cowgirl Cottage Cheese dumplings), raclette, cheese toasties (either cheddar or crescenza), and stuffed flatbreads. You can also get chilled milk drinks, like coffee, chocolate, or raspberry, along with cream sodas and spritzers. The Marin style includes tiles from Heath, reclaimed elm wood counters, and blue gum eucalyptus walls. Hours are Mon-Sat 7am-3pm and Sun 10am-6pm (Saturday hours will extend to 7pm in a few weeks). Flickr photo by Thomas Hawk. 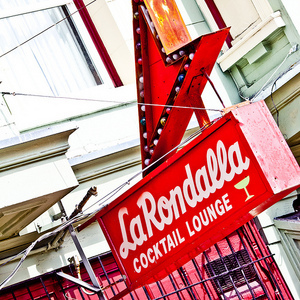 A few mini-Mission items: according to Uptown Almanac, it looks like there is finally some activity in the long-closed ~LA RONDALLA~: the space is currently gutted, and according to workers on site, the owners hope to open before Christmas. There are no changes on the liquor license, so it looks like the Barrios family continue to own it. 901 Valencia St. at 20th St.
Just down the street, the ~THE BLUE FIG~ cafe is now open, serving items ranging from “blue waffles” to croque-madames to Reubens. 990 Valencia St. at 21st St.
And this Wednesday, the ~PAL’S TAKEAWAY~ guest chef series continues with Ryan Ostler, formerly from Bruno’s and Broken Record, busting out a Marin Sun Farms pulled lamb goodie on his housemade pita bread with apple-jicama slaw and harissa. Hubba. 2751 24th St. at Hampshire. After some delays and final inspections, ~THE SUMMIT~ will finally be opening this Thursday September 30th. To recap a previous tablehopper posting, hours are Sun-Mon 8am-11pm and Tue-Sat 8am-2am; within that timing, pastries are available 8am-5pm, the lunchtime menu is from 10:30am-3pm, dinner is 5:30pm-11pm, and dessert service is 10:30pm-2am (Tue-Sat). Looking forward to trying all of it, from the coffee service to lunch (mmmm, red pastrami sandwich!) to late-night dessert. Flickr photo from Thomas Hawk. 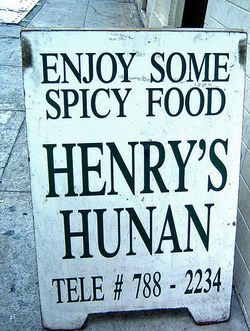 Looks like the ~HENRY’S HUNAN~ empire is going to open their sixth spot in the Excelsior: they will be opening their latest location in the former Granada Cafe. There will be 80-90 seats, with a full bar. The target date is the end of November or beginning of December. 4753 Mission St. at Leo. Photo from Off the Grid. Yeah baby, it’s all about street food, all the time! 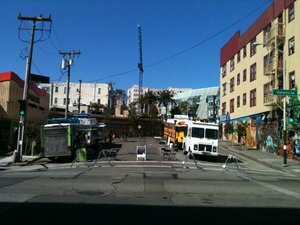 The latest location for the ~OFF THE GRID~ truck and street food stand gatherings is Saturdays on McCoppin, that little dead lot right next to the U-Haul store off Valencia Street. You know, the place you go to score your crack. Anyway, now you can score eats from the likes of the El Norteño Taco Truck and Liba Falafel during the day, and dinner from trucks like Curry Up Now and 51st State. There will also be three new mobile vendors: Little Green Cyclo (Vietnamese bahn mi), Brass Knuckle (waffle-pressed sandwiches), and Le Truc Gastrobus. Lunch is from 11am-4pm, and dinner is from 5pm-10pm—just follow @SFcarts or check on Facebook for updates on who will be parked there on Saturdays. To recap, there is also the big Fort Mason gathering on Fridays from 5pm-9pm, Upper Haight on Thursdays (from 4pm-8:30pm), and Civic Center Friday during the day from 11am-3pm. COCO5OO’s chef, Michael Morrison—a Mediterranean mixmaster known for his handmade pastas and wood oven-baked fish—has now taken the helm of ~THE MOSS ROOM~, collaborating with owner Loretta Keller. He is also going to be the next featured chef in the ~LOCALIZE~ series of dinners from Noise 13 and TABLEonethree, which will be on Monday October 11th. 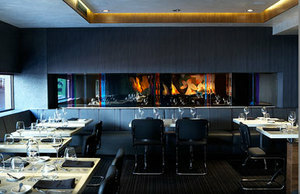 It’s official: Daniel Patterson’s 48-seat Oakland project, ~PLUM~ opens this Wednesday the 29th, and along with it is a new addition to the Daniel Patterson Group: Ron Boyd (AQUA, Beautifull) has signed on to take over the role that Jeremy Fox was to fill at Plum and in the group overall. Boyd will oversee Patterson’s restaurants (Coi, Il Cane Rosso, and the upcoming Plum, though the further-out Bracina will be chef Lauren Kiino’s main responsibility), and Boyd will also work on developing new ideas for the group, its garden, and allowing Patterson to focus on and be present daily at Coi. Boyd was formerly the chef de cuisine at AQUA, and most recently, was conducting R&D for Beautifull’s healthy prepared foods. Earlier in his career, Boyd was Patterson’s chef de cuisine at Elisabeth Daniel. Kiino will be playing a big part in Plum as the opening chef. Bill Corbett will be doing the desserts at Plum (like roasted white chocolate parfait with huckleberry and tarragon, $9), but Boyd will also be now working with pastry chef Deanie Hickox, who left Manresa to help out at Coi. So, what’s going to be on the menu at Plum? It’s well priced, with many dishes under $20, and a four-course menu for $45. There are snacks to start, like chickpea fritters or crispy chicken skin with seaweed (both $4); starters like a smoked black cod and potato purée ($12) or chilled eggplant soup ($9); larger vegetable dishes like mushroom dashi with yuba, tofu, and greens ($13) or steamed chanterelle custard with nettles and hazelnuts ($13); meaty mains like slow-cooked farm egg with savory chicken-giblet fried farro and sprouts ($17), or seared squid with kohlrabi, mustard greens, and black rice porridge ($18). And since it’s open late, there will be a burger (gasp) and a delicious grilled cheese sandwich. As for the wine list, wine director Andrew Mosblech has put together an international list with about 50 selections, and 25 will be available by the glass or “flask.” The wines were described to me as balanced, fresh, and food friendly, with a focus on good value, integrity, tipicity, and a sense of discovery (look for some unique grapes, like moschofilero and schiava). As for you cocktail lovers, Scott Beattie’s list (and bar) won’t be in effect until next year, but one of his aperitif/cocktails will be on the opening list, the Bella Rufina (brachetto, orange bitters, amarena cherry), along with some sakes, sherries, and beers. The space will have some drama, like walls in deep colors, a chandelier, and of course some unique art, like X-ray cross-sections of plums. There will be either counter or communal table seating. Hours will be 5pm-1am daily. Reservations accepted! 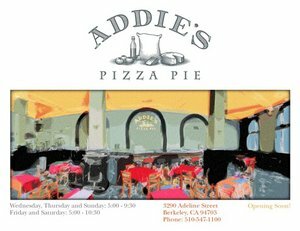 A tablehopper reader tipped me off that ~ADDIE’S PIZZA PIE~ is now open in Berkeley. Berkeleyside has more details: the project is from Jennifer Millar of Sweet Adeline Bakeshop and Thomas Schnetz of Flora, serving almost ten kinds of New York-style pies, along with three kinds of frozen custard. Dinner Wed-Sun. 3290 Adeline St. at Alcatraz, Berkeley, 510-547-1100. And starting tonight, September 28th, ~TRADER VIC’S EMERYVILLE~ will reopen its doors after closing in April for a remodel. Look for a larger lounge area and an additional banquet room, new furniture, and even more rum cocktails. 9 Anchor Dr. at Powell, Emeryville, 510-653-3400.